Please complete the form below and submit it online. 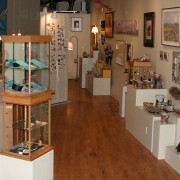 Accepted Exhibiting Artist members pay a $100 annual membership fee. First year dues will be pro-rated according to the number of remaining months in the calendar year. 30/70:18 days participation (1.5 days/month) plus $100 annual fee, pro-rated for membership date. 20/80: 24 days participation (2 days/month) plus $100 annual fee, pro-rated for membership date.